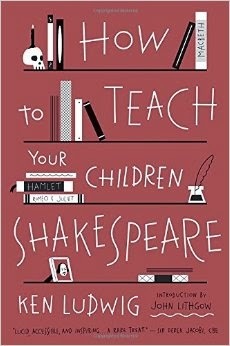 I chose to receive a copy of Ken Ludwig's "How to Teach Your Children Shakespeare" primarily because I know next to nothing about Shakespeare, and I wanted to see if I could still manage to teach them Shakespeare while learning about his works myself. And I am happy to report that YES I CAN! In fact, this book was so fun to work through that Mr. Measure and I will often try to see who can quote A Midsummer Night's Dream lines to each other. Ken has such a natural and kind way to teach heady plays and poetry, but not be condescending at all. He teaches how to memorize important lines, but in addition to that, he gives you background, understanding, and cool insights into these masterpieces. Even if you don't want to memorize lines, just reading the information, the background, and the explanations is well worth the cost of the book. This book has been in my amazon cart for months :) Someday!